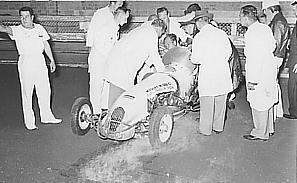 The use of 'Larry Taylor' photos by permission of Taylor family. 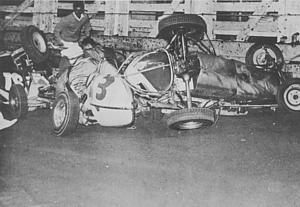 One of the Royale's most famous Speedcar crash shots, that of Peter Cunneen in the magic little twin # 4, suspended mid air by his chest belt. 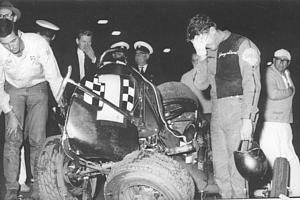 "Leadfoot" Lenny Brock looks a sad and sorry sight after a big one on the Bull Pens corner. 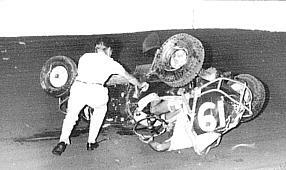 Big Jack O'Dea from Victoria in car # 65 gets up on one wheel through Pit turn. 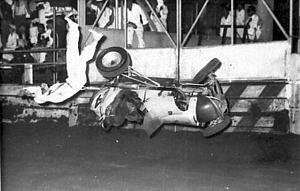 The aftermath of the fatal Jack Bissaker accident at the Royale on 21/10/61. 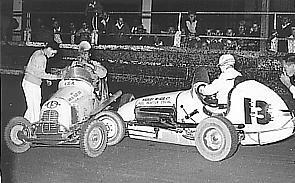 January 7th 1961 and Peter Johnson travelling the high line in car # 85 and Johnny Peers in # 21 come in contact. Johnson, whose real name was Peter Pantlin, died seconds after this photo was taken. 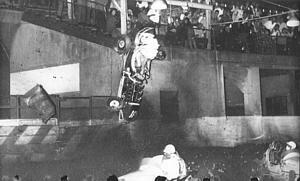 The start of one of the biggest muliple car crashes at the Royale during the running of the NSW title. 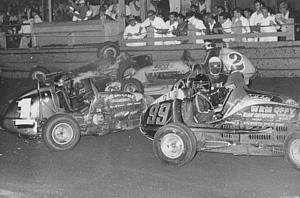 Freeman # 55, Andy Mc Gavin, Len Brock # 99 and Johnny Stewart # 45. They were all flat strap at the time. 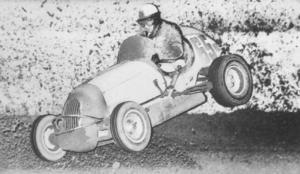 A famous crash shot of Leadfoot Lennie Brock at the Bullpens corner. Bryan Cunneen looks up as Brian Meyers in # 97 slips past. 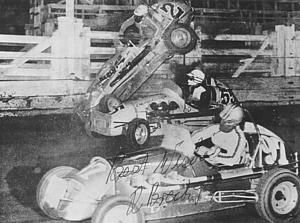 Johnny Stewart # 1, Queenslander Blair Shepherd in # 99, Sid Middlemass in # 2, Lew Marshall in # 54 are halted by Peter Cunneen ( upside down ) in the Higgins Bros Holden # 30. 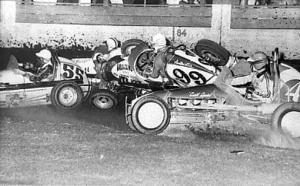 Al Staples in # 12 is on his side while Sid Reed in # 3 nudges Sid Clarke in # 51. 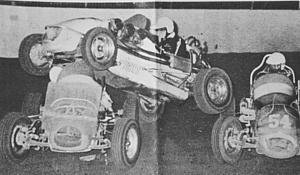 Garry McClenahan in # 23 leap frogs Ray Oram in the Linklater # 55 while Sid Middlemass in the Wells Toyota looks for an inside run. 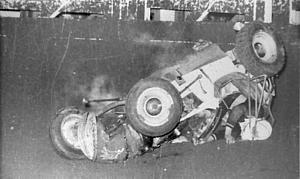 A very dejected Johnny Stewart walks away from the McGee Shell Trackburner # 1 after a big one. 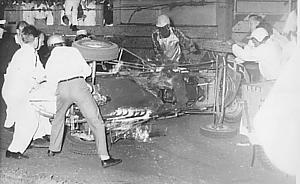 Bob Holt # 19 runs with John Harvey # 76 just seconds before Holt climbed the Martin and Angus stand, breaking the arm of a spectator leaning over the railing ( 18ft up !). Note Harvey is wearing a fire proof driving suit with full harness belts, Bob is wearing shorts ! Bob Holt setting the altitude record at the Royale. Note the Shorts ! 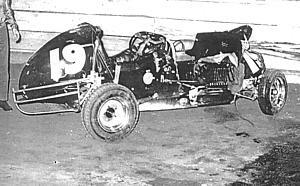 Bob Holt's # 19 Holden midget after it fell back to Earth. 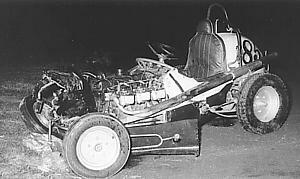 The wreckage of the Peter Johnson fatal smash. 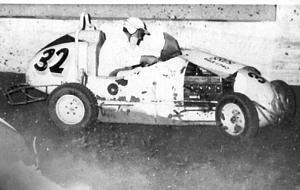 Another one of "Leadfoot" Lennie Brock's bingles. this time on fire. 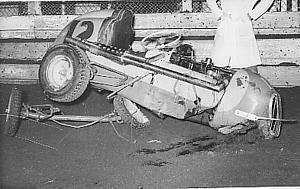 The mangled remains of the Madden # 12 after a smash when being driven by Rob Greentree. 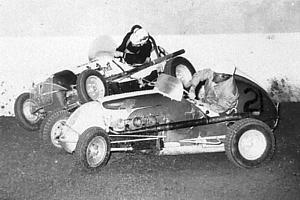 Andy McGavin in the Bill Clement's Holden # 15 adjusts his goggles while Werner Greve checks out # 13 after a tangle. 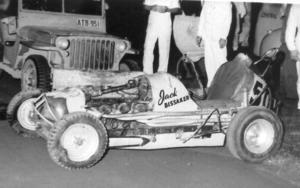 The # 13 McGee Holden of Greve's was one of the most beautiful midgets I have ever seen, white, black and chrome with a little German flag on the tail. 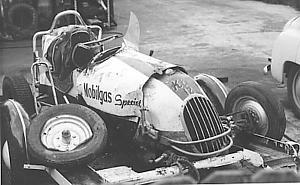 This is the ex Frank Brewer # 48 car brought to Australia in 1948 , rebodied of course. Werner's out like a light after this one! It was heavy. 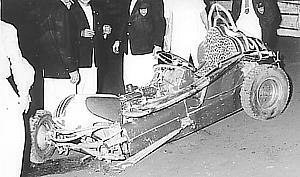 4th February 1961, Johnny Stewart was having a drive of this car # 98 for the first time and whacko !. Wouldn't be a popular boy with the car owner. #12 the Madden Holden is in the wars again.